New branch of airplane LaGG will be added to the Soviet Tech Tree. Since its launch this past summer, War Wings has topped the charts around the globe, enthralling players with real-time action, beautiful graphics, and historical accuracy. Now, there's even more for fans to be excited about. New Research Planes. 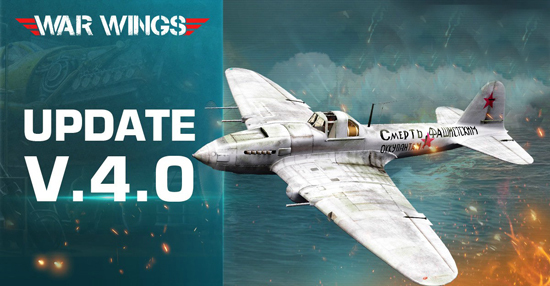 Players can enjoy seven different varieties of the brand-new LaGG Series plane, a low-altitude interceptor, which will be added to the Soviet Tech Tree. All LaGG Series are equipped with rocket-propelled grenades to intercept enemy aircrafts, as well as machine guns and cannons. Even more planes. Players can also check out the IL-2, an air-to-ground attack aircraft that grew to infamy in WWII. As bombers go, its superior firepower proves it's one of the best. New Elimination Mode. For a limited time, players can test out the brand-new Elimination Mode. In Elimination Mode, each player chooses three airplanes before battle, which, unlike in other modes of play, can't be revived once destroyed. Which ever side destroys all the enemy airplanes wins-and, just like in a real battle, the reward for victory can be great. New squadron system. Join a squadron to receive a new supply box reward every week. Players can earn squadron activity points through matchmaking-players with the most activity points will be featured on the leaderboard. War Wings is a free-to-play mobile title that features real-time 4v4 online aerial dogfighting action with stunning 3D graphics. The game simulates World War II air combat with a dedicated adherence to historical accuracy, technical detail, and real-life flight dynamics. Players acquire and upgrade authentic WWII-era warplanes as they compete against other pilots from around the world for PvP air supremacy! War Wings is currently available for download for Android devices from Google Play in most European countries. An iOS version of the game is coming soon to the Apple App Store.